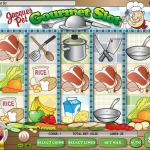 Jacques Pot is a slot game by Rival that combines refined French cuisine and a slots game…. Yes, we have no idea what the developer was eating but the result is this game! 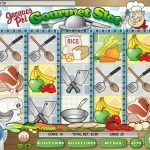 Basically you are invited to Chef’s Jacques kitchen where you will help him line up some of his favorite foods. If you’re hungry please continue reading. The Wild symbol in this game is the Salt & Pepper symbol that will substitute any other symbol to create a winning combination. The wild only appears on reels 1, 2 and 3 and when you get 2 and 3 wilds you’re winnings will be awarded with a 2x and 3x multiplier. Not bad. There are also two scatters. The first scatter is the Mixer symbol. Landing 3 or more will award you with 10 Free Spins with a 2x multiplier for winning combinations during those rounds. The second scatter is the Jacques symbol himself. Landing 3 or more will trigger the Bonus Round. The catch is that Jacques only appears during Free Spins rounds so you have to hope to get him during these 10 rounds. Assuming you got to the Bonus Round you will be taken to a new screen. There you will control an empty burger bun and you have to catch burger ingredients that fall from above to create a nice burger. The bigger the burger you make the more you will win with a chance to get 200x of your total bet. That’s definitely a reason to stay and try that burger! 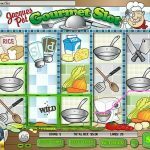 Jacques Pot is a nice game with a horrible looks. It really feels old but to be honest it is quite original. We don’y like the fact that the only way getting to the bonus round is through the Free Spins. Other than that this game is not so bad. Maybe you are more into pirates and treasures? Try playing Jolly Rogers Jackpot a 5 reel slot by Rival.